It was a successful June climb of Mount Thomson, but fatigue kicks in during the return to camp. Climber slips on patch of hard snow, loses ice axe, and slides out of sight. Cause: Slip on Steep Snow (caused by fatigue and inattention/poor technique, according to injured climber). No helmet. On June 21, our team of 4 completed climb of West Ridge and descended the East Ridge. We stopped for a break in the bowl below Thompson before continuing our descent. At this time, one of our party took his helmet off - all other team members kept theirs on. This went unnoticed. 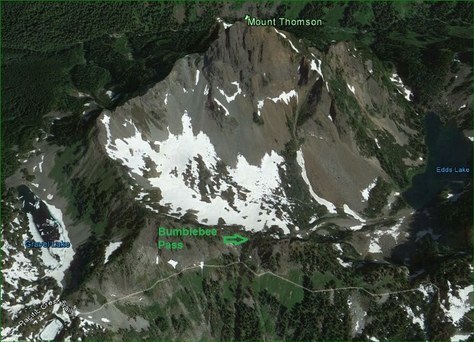 The next part of our return was climbing up to Bumblebee Pass, and then regaining the Pacific Crest Trail. The slope up to the pass was steep (about 35-40 degrees?) and snow covered. All team members used ice axes. Snow was mostly soft, but not uniformly - some harder spots still remained in the snow. We were not using crampons on this slope. From my perspective - I heard the sound of someone sliding above me. I went into self-arrest and felt one of our party bounce off of me. I turned around to see him continue sliding down the slope. We all yelled at him to arrest, but he was picking up speed and lost his ax shortly after he began sliding, and was not able to arrest. He slid far down the slope, out of our sight. He came to a stop about 200-250ft below us. The other two party members reached him and began MOFA. The injured party member was bleeding from a cut on his nose, a cut above the eye, and a cut on his arm. He was shaken up, but had not lost consciousness and could move all limbs. We gave him warm clothes and a pack to sit on to get him off the snow. We asked the injured party member to answer many questions about his whereabouts, time, date, our names, etc, and it was determined that he was mentally sound. He felt achy, but also felt that he could walk. We decided it would be best to belay him back up the slope, and much of the way back to camp. I took a rope end and set up an anchor to toprope our injured party member as he climbed back up to the PCT turnoff. The other two party members climbed alongside him to assist. We continued back to camp tied into a rope, (as in glacier travel), and our injured party member was able to walk on his own power. When back at camp, we administered additional first aid, cleaning the cuts and applying bandaids. We continually gave our injured party member mental checks, and he passed every time. It was decided that I and another party member would hike out to Kendall Catwalk to reach cell service, and contact our families. We bivied there for the night. Our injured party member stayed in camp that night, with the designated MOFA person monitoring his health. The plan was that the MOFA person could help him walk out the next day. In the morning, my companion walked back to camp to assist in the hike out, while I stayed on the Catwalk with one of our personal radios and cellphone to coordinate any needed communication between the rest of the party and the outside world. At about 7am, the party at our campsite contacted me on the personal radio to let me know that after resting for the night, our injured party member was feeling ok and they were heading out. We continued to walk as a rope team through the steep snow slopes on Kendall. The injured party member was able to walk under his own power and generally had a positive attitude. After a trip to the doctor, it was determined that our injured party member had suffered a broken nose, and also a broken thumb. If “causes” are part of the report, the cause was fatigue and its accompanying unfocused inattention and bad technique; The at-scene rescue and ensuing recovery were carried out "excellent plus" by the accompanying climbers. How frequent are reports of failure to self-arrest when not wearing crampons? Are we neglecting to utilize crampons when teaching snow travel?